Derby athletes train all the time. All. The. Time. On skates. Off skates. They train to acquire and improve individual skills and to enhance team performance. When it comes to the individual athlete, we often talk about mental toughness and the ability to perform under pressure. 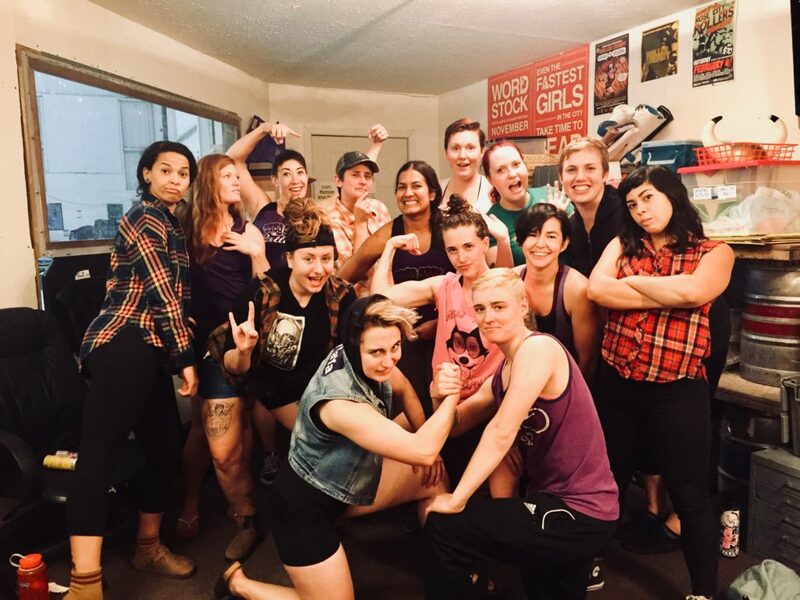 This week, Iggy Perillo of WSL Leadership Coaching—one of Rose City Rollers’ sponsors—writes about what it takes to cultivate and sustain a positive team culture. Iggy works closely with Rose City’s teams to ensure that team culture enables team performance. Iggy was slated to speak at this year’s Roller Derby World Summit. If you’re interested in learning more about the work Iggy does, check out the WSL Leadership Coaching website for their podcast, more articles, and other resources. What is positive team culture? Team culture has been defined as the worst behavior that a team tolerates. Starting with that definition positive team culture creates an optimal environment where people communicate, feel valued, and contribute to team goals. Positive team culture is not the same thing as happiness or silliness: it means a sense of authentic connection that is deeply satisfying while individuals and the team are striving for more. Positive team culture is sustainable, effective and magnetic. When team culture is positive, trust grows between teammates and people are willing to commit and persevere with effort over time—which leads to growth and improvement. It means individuals are recognized and valued for their differences; in other words, people are allowed to thrive as themselves. All these growing/improving/thriving people create growing/improving/thriving teams. Who wouldn’t want to be a part of that? Positive team culture also contributes to positive league culture which in turn increases longevity and competitiveness for the entire league and all its members. What are some signs your team culture might need attention and a push in a positive direction? How do you build positive team culture? Get to know all your teammates. What makes them unique? What makes them feel valued? The open secret to this is more listening than talking. Sit next to the person on your team you know the least ask them a question and listen while you lace up your skates. Increase communication and advocate for increased communication among your teammates. Maybe you’re in a position to ask others “What is the best way to communicate with you?” Maybe you need to articulate and coordinate information sharing procedures within your team. Maybe when you don’t hear from people that you expected to hear from you need to approach them with curiosity (not judgment!) and tell them why more communication matters to you and ask what would increase their communication. If you’re in a position to create events for “team bonding” make sure the events include all your teammates. This means planning an event (or multiple events) that are accessible for your introverts, teammates under 21, folks with family obligations, etc. Optimize your events for people getting to know more about each other and not just clumping with their besties. If you only have practice time together then include some activities that help teammates get to know each other and communicate better. Act with integrity and approach team stressors and struggles directly. Nothing will toxify a team faster than ignoring disrespectful behavior. Anyone can say “That doesn’t sit right with me. Let’s talk more about it.” Start the conversations. Many people tell you gossip is a problem on their team and in the same breath tell you they’re not a gossip. If you have a judgmental view of someone or their behavior and you are on a “fact finding mission” to see if others agree with you then you are gossiping. Instead, approach the person you are feeling judgmental about and ask questions to learn why they appear to be making choices that seem to have such a negative impact. Approaching these people and having conversations based on curiosity—not judgment—will move things along productively. Or, if you really aren’t sure if the behavior you’re seeing is as negative as you think, find a trusted teammate to discuss ways to address the behavior before bringing it up with the person directly. Your trusted teammate might be able to provide perspective you’re lacking or help you approach the other person with curiosity and integrity. Acknowledge and support differences among your teammates. For example, the chatty jokesters need time for that and the quiet thinkers need space for that too. People naming and articulating their needs can help make sure they are met. This would cut down on bench stress when some folks need quiet between jams and others need to talk it out in detail. Different perspectives, personalities, thinking styles, etc. can work together harmoniously when everyone is clued in to what is going on and there is a plan to meet people’s needs. Figure out how your teammates like to be appreciated and do whatever it takes to make sure they know they are valued and important regardless of their role on the team. There really are endless possibilities for creating and supporting positive team culture. Basically, if it increases connection and builds trust between team members then do it. If it doesn’t then don’t. If you’re not sure, talk it out with a trusted teammate whose perspective you value. When more teammates are taking action to build positive team culture it gets easier and better. Even simple actions like listening attentively can help. Give something a try at your next practice/meeting/bout. You will be glad you did.